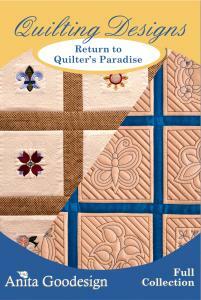 Return to Quilters Paradise contains two different types of designs. The first type is a traditional "redwork" design but instead of just giving the design to you by itself we created a unique motif stitch frame around the design. By stitching the design with a layer of batting between two layers of fabric you can create a unique puffy quilt. The motif designs come in three different sizes. The second type of design in this collection is a "stitched" version of the designs. The "stitched" versions come in two different sizes. We are also including five different stipple frames. The stipple frames go with the "stitched" designs and create a perfect border for you to create a beautiful quilt. We created three projects; two quilts have the "stitched" designs with stipple frames and the third "puffy" quilt was created with the traditional "redwork" designs. First experience with you, and pleased. Thanks.